A mother comforts her child as they wait in line for a ride at the Alcona County Fair on Wednesday afternoon. 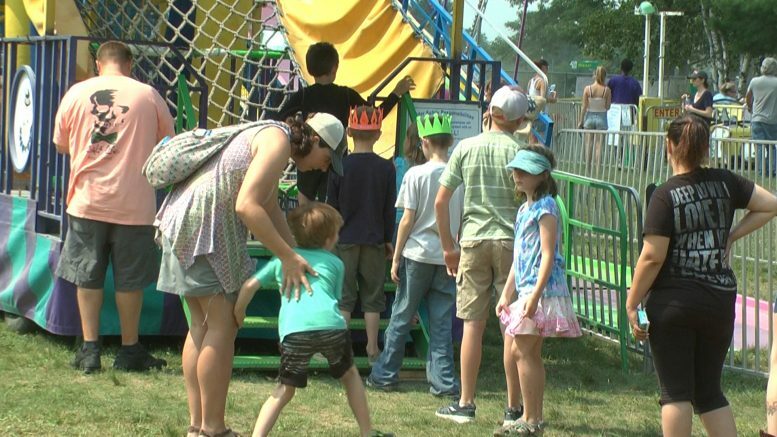 Lincoln — Grandparents and children packed into the Alcona County Fair on Wednesday afternoon to enjoy day two. Kids could ride the rides for free from 2:00 p.m. until 4:00 p.m. Seniors got into the fair for only a $1. Volunteer Kevin Boyat Sr. has been volunteering his time for the fair grounds for over 30 years. He helps out whenever called upon and enjoys this day especially as a grandfather. With dozens of rides, kids ran around and enjoy the hot summer day in Northeast Michigan. Grandparents watched as their grandchildren rode carousels and Ferris wheels. The day also featured the special steak dinner, an annual delight for the locals. A horse pull took place in the evening at the track next to the pavilion and barns.